One fine day, in the middle of May,The ladybird went on holiday. 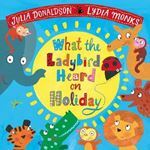 Join everyone's favourite crime-busting ladybird on holiday and come face to face with some familiar thieves in the third story in the fantastic What the Ladybird Heard series, with glitter on every page. Poor little monkey! He's lost his mum. Luckily butterfly is nearby to help him find her . . .
Meet Detective Nell, a very inquisitive dog, and follow her adventure investigating the curious case of the missing books! Playgroup has begun. Time to have some fun. There's a commotion in the classroom as Goat and the other animals spend the day at playgroup. The musical instruments and the dressing up box are lots of fun, but - oh dear! - Goat gets into a muddle or two. A comforting story for any child starting at, or already attending, a playgroup.